A French chef is "surprised" to find he is back in this year's Michelin guide, despite requesting to be taken out. Sebastien Bras' restaurant Le Suquet returns to the directory with just two stars, having previously been awarded three. The chef's concerns over the possible inspection of every meal prompted the decision to be removed in 2017. Le Suquet's reinstatement in the 2019 Michelin guide "left us with doubts", he said. The restaurant guide, originally designed for motorists finding places to stop off en route, says two stars shows "excellent cooking, worth a detour", while three means it is "worth a special journey". Based in the Aubrac region, Mr Bras took over Le Suquet from his father in 2009 and prides himself on sourcing natural, local ingredients, often from the family garden. In 2017 he told AFP that the three star rating had given him "a lot of satisfaction," but he dreaded knowing inspectors could appear at any time. Michelin agreed to remove Le Suquet because it was difficult "to have a restaurant in the guide which does not wish to be in it". "Maybe I will be less famous, but I accept that," the chef said. 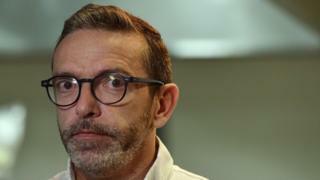 In an interview following his re-entry, Mr Bras told Centre Press Aveyron that Michelin had made it clear a restaurant has no choice but to live under pressure. There have been disappointments elsewhere in this year's guide. The Alsace restaurant Auberge de L'Ill lost its third star after 51 years with the accolade. "I don't know how to explain this loss," Chef Marc Haeberlin told France 3 Alsace television. The restaurant has been in the family for 150 years. But there was a strong emphasis on younger, female and more international chefs, with 24-year-old Julia Sedefdjian earning her first star for Paris-based, Nicoise-inspired restaurant Baieta. Argentinian Mauro Colagreco is now the only foreigner to have three stars in France for his Mirazur eatery on the Cote d'Azur. "So many emotions. Thank you! I'm so honoured," he said.